The surge of women running in the midterm elections, many of them Democrats spurred by antipathy toward President Donald Trump, smashed a U.S. House of Representatives record, with 100 winning election or re-election by Thursday. Their victories eclipsed the current tally of 84 seats held by women in the current House session. The elections got off to a promising start for breaking barriers not only in the House but also the U.S. Senate and governor's races with the first result to be recorded: the territory of Guam chose Democrat Lou Leon Guerrero as its first female governor. When the first flip of a House seat of Tuesday night came, from Republican to Democrat, it was in a Virginia race where state Sen. Jennifer Wexton defeated the two-term GOP incumbent, Barbara Comstock. The second Democratic gain went to a woman, too. Donna Shalala, secretary of Health and Human Services under President Bill Clinton, beat Republican Maria Elvira Salazar to replace Republican Rep. Ileana Pos-Lehtinen. By the end of the night, Democrats had taken control of the House. 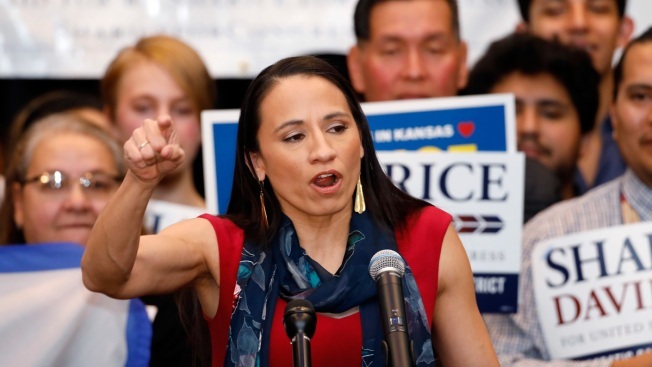 Other firsts among Democratic women: Sharice Davids became the first gay, Native-American congresswoman in Kansas while in New York, Alexandria Ocasio-Cortez became the youngest woman elected to Congress at 29. The first Muslim-American women were elected, Rashida Tlaib in Michigan and Ilhan Omar in Minnesota. Pennsylvania went from having no women in its delegation to having four. A surprise win came in in Oklahoma where Kendra Horn won what was thought a safe House seat for Republicans. And Ayanna Pressley will become the fist black woman in Congress representing Massachusetts. In the governor's races, Laura Kelly beat Republican Secretary of State Kris Kobach in Kansas and Gretchen Whitmer won in Michigan. In New Mexico, Rep. Michelle Lujan Grisham was projected to become the first Democratic Hispanic woman to be elected governor. Among Republicans, Rep. Marsha Blackburn, was elected Tennessee’s first woman U.S. senator. In the gubernatorial races, Republican Kay Ivey retained her seat in Alabama. "We’re seeing this pretty important shift in the makeup, especially on the Democratic side, in terms of the leadership and who are going to be the rising stars in that party," said Eric Schickler, the Jeffrey & Ashley McDermott Professor of Political Science at the University of California, Berkeley. "I do think that is one of the noteworthy shifts. Whenever there’s an open seat or a potential vulnerable Republican, female candidates did really well, probably mobilized in part by anger over Trump. And I expect to see that continue." But some incumbents suffered losses. Senators Heidi Heitkamp in North Dakota and Claire McCaskill in Missouri, Democrats serving in red states, came up short. Challenger Amy McGrath, who became the first woman Marine to pilot an F-18 in combat, lost in Kentucky for a House seat. A record number of women ran for office this year: 237 women for the House, up from 167 four years ago, and 23 women for the Senate, beating 2012’s record of 18, according to The Center for American Women and Politics, a division of the Eagleton Institute of Politics at Rutgers University. Sixteen women ran for governor. Democrats led in nominations: 77 percent of women in the House, Senate and governor’s races. Among progressive Democratic women, the 2016 presidential election appeared to have been a catalyst, said Kelly Dittmar, the center’s Gender Watch 2018 project director. They competed to preserve health care, preserve environmental regulations and push back against other parts of the Republican agenda, she said. Many were first time candidates who worried less than women before them about having all of the right experience and credentials. Trump’s success, against Hillary Clinton, a candidate with more government qualifications, may have convinced them to dive in, Dittmar said. Early results from the NBC News Exit Poll showed a divide between the parties on the importance of electing more women to public office. Some 46 percent of voters said it was very important for more women to be elected; among them a large majority of Democrats, but just 18 percent of Republicans and 41 percent of independents. Another window into voters’ positions was their view of the confirmation of Brett Kavanaugh, accused on sexual misconduct, to the U.S. Supreme Court. Voters were more likely to oppose than support his appointment, 48 percent to 43 percent, and women even more so, 53 percent to 37 percent in support. Men on the other hand supported it 50 percent to 44 percent against. Sierra Jackson contributed to this story.